"I have to defend him without knowing all the facts." 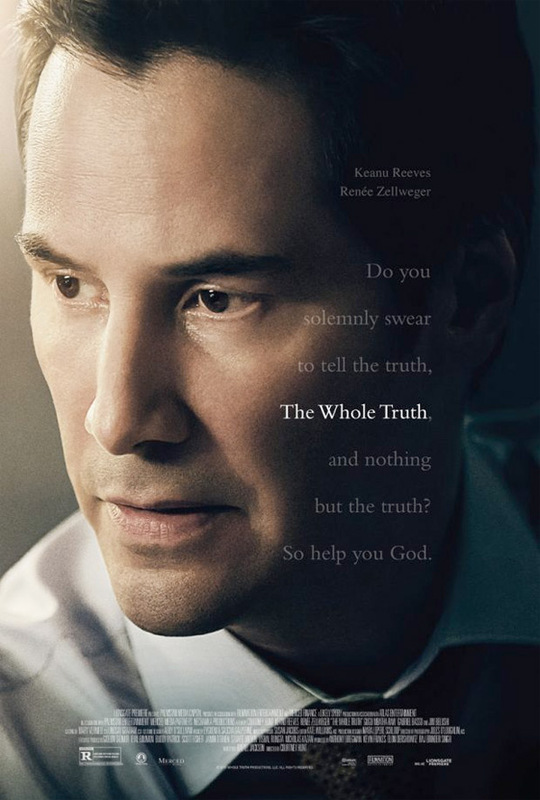 Lionsgate has revealed the trailer for a film titled The Whole Truth, a legal thriller starring Keanu Reeves as a defense attorney in a murder case. His job is to build a defense to keep his friend's son out of jail, even though it seems his conviction for murder is pretty clear. The film also stars Renée Zellweger, Gabriel Basso, Gugu Mbatha-Raw, Jim Belushi, Sean Bridgers	and Christopher Berry. Maybe I'm just a sucker for anything Keanu Reeves stars in, but this actually looks damn good, with some intriguing questions being asked about how the law works and whether or not someone is trying to cover up the truth. I'm curious. This definitely looks like it'll be worth watching. Defense attorney Richard Ramsay (Keanu Reeves) takes on a personal case when he swears to his widowed friend, Loretta Lassiter (Renée Zellweger), that he will keep her son Mike (Gabriel Basso) out of prison. Charged with murdering his father, Mike initially confesses to the crime. But as the trial proceeds, chilling evidence about the kind of man that Boone Lassiter (Jim Belushi) really was comes to light. While Ramsay uses the evidence to get his client acquitted, his new colleague Janelle (Gugu Mbatha-Raw) tries to dig deeper – and begins to realize that the whole truth is something she alone can uncover. The Whole Truth is directed by American filmmaker Courtney Hunt, of the indie film Frozen River previously. The script is by Nicholas Kazan. Lionsgate opens The Whole Truth in theaters + on VOD starting October 21st. Actually the sequel to The Devil's Advocate. Zellweger's face is completely different. // This looks kind of boring and non-compelling. Jim Belushi? Why's he not cracking the funnies? Will never see this, looks dull balls. JUST GIVE US JOHN WICK 2 ALREADY!! !